It helps to illuminate your path, making them safer, but also adds a beautiful accent to the night landscape. It features brighter, better solar panel, longer working hours and humanized design. It&apos;s structured with metal and ABS plastic material and water resistance, perfect for outdoor landscape illumination. Solar ground lights of in-ground solar light automatically lights up when night comes and automatically turns off when sun rises. Decorative outside solar buried lights for your garden, pathway, yard, step, classy and make them safer and different than the traditional outdoor in-ground solar lights. 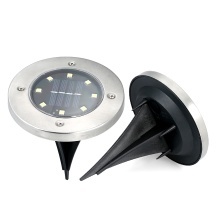 IP65 Waterproof, never worry about exposing outdoor solar lights to the rain or snow. Easy to use, no wiring or external electricity are required, can be easily installed. Only need push the spike of solar flood lights into the soil. These solar powered lights with 8pcs LEDs its brightness is up to 80lm, built-in 1200mAh rechargeable battery.